Are you searching for an experienced Mission Viejo Irvine and Orange County property negligence and injury attorney? Property owners have a legal duty to keep their premises safe and clear of dangerous conditions. This responsibility applies not only to buildings and other structures on the property, but also to the land itself, including sidewalks and parking lots. When a property owner is negligent in maintaining his or her property, slips-and-falls and other types of accidents can occur, often leaving victims with serious and painful injuries. This responsibility extends to many forms of property negligence including upended or uneven surfaces sidewalks or floors, poorly market hazards such as an unexpected step down or up as well as railings and other protective devices. It is the responsibility of commercial locations and care facilities such as nursing homes and extended care facilities to take every possible action to prevent falls which result in injuries. At the Law Firm of Rivers J. Morrell, III, our Orange County slip and fall injury lawyer has more than 40 years of experience representing injured victims in personal injury claims. We can help you pursue the compensation you deserve while holding negligent property owners accountable for their actions. When Is A Property Owner Negligent? A property owner has a duty to take care of dangerous property conditions if he or she knew or should have known that a hazardous condition was present on the property. In other words, a property owner cannot simply ignore or refuse to look at remove or repair a potentially dangerous or hazardous condition in their store, business or public property. If he or she should have known that the condition existed the owner may be liable for any injuries that resulted from property negligence and the resulting dangerous condition. 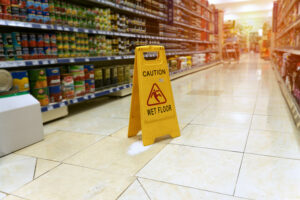 If you have suffered serious injuries in a slip-and-fall on another person’s property, whether due to wet or slippery flooring as a result of a spill or substance which was not promptly identified and cleaned up, lack of a stairway handrail, torn or uneven carpeting, uneven or broken pavement, or as the result of another dangerous property condition, you may be entitled to financial compensation for any resulting injuries. Our experienced attorneys will thoroughly review your case and work hard to help you recover full and fair compensation for the injuries you’ve endured and the impact they have had upon your life..
Property negligence results in hundreds of injuries across Mission Viejo Irvine and Orange County each year. If you or a loved one has been hurt or injured while visiting a business, commercial, public or private property we invite you to review the recommendations of our clients and the legal industry and contact us online or call (949) 305-1400 for a free consultation with one of our experienced injury attorneys. There is no cost to our clients out of pocket as we work on a contingency fee basis.